Tax expenditures are defined as a government’s estimated revenue loss that results from giving tax concessions or preferences to a particular class of taxpayer or activity. Although they constitute a large – and often growing – burden on the public purse, they have generally been exempt from public scrutiny. They are often managed outside the regular budget process, reducing both transparency and consistent oversight. Tax expenditures represent a critical aspect of tax policy; they can impact inequality directly, by giving preference to certain groups over others, or indirectly, by reducing the revenues available for redistributive spending. Tax expenditures are especially significant in the Latin American context due to the magnitude of the revenue loss they cause and the resulting impact on public spending. 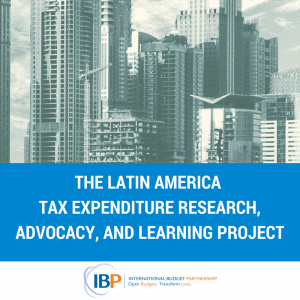 Over the past few years, IBP has collaborated with a group of Latin American civil society organizations in a research, advocacy, and learning project around tax expenditures and their impact on inequality in the region. Facilitated and coordinated by IBP, the Latin America Tax Expenditure Research, Advocacy and Learning (LATERAL) project aims to support civil society work in increasing the transparency, equity, and accountability of tax expenditure policies at the country and regional level. The LATERAL project was motivated by the recognition that governments across the region, despite adopting language and policies promoting fiscal austerity and spending reductions, often fail to collect a significant percentage of revenues they are owed. Fiscal austerity policies currently being promoted across Latin America rarely include discussions on reforming or reducing the fiscal privileges governments distribute through tax expenditures. These policies often lack a clear assessment of their expected benefits or analysis of their impact on income distribution. Given the opaqueness of legislation around tax expenditures, civil society has not had adequate space to engage, but the increasing amount of information being made publicly available, and the urgency of the fiscal crisis that many countries are facing, have resulted in a call for more debate and action. In June 2018, IBP and its civil society partners in the LATERAL project will gather in Lima, Peru, to share findings of their respective in-country research along with the different approaches used to evaluate tax expenditures, even in data-poor contexts. They will reflect on their current country-based advocacy and communication efforts on tax, and the unique challenges they have faced. IBP and partners will then meet with the Latin America Tax Justice Network (Red de Justicia Fiscal de América Latina y el Caribe) before a presentation of the findings of the country-based research at the Tax Justice Network Annual Conference. Tax Policy and Inequality in Latin America. This paper summarize the available research literature on tax expenditures in Latin America. Tax Expenditures and Inequality in Latin America. This paper places the issue of tax expenditures in a broader fiscal context. A Quick Guide to Researching Tax Expenditures in Latin America. This guide outlines the steps needed for a civil society organization to research tax expenditures. Evaluating Tax Expenditures: A Framework for Civil Society Researchers. This guide present a framework for civil society researchers on how to evaluate tax expenditures. Several challenges lie ahead in the pursuit of equitable tax policy, including navigating countries’ political economy constraints in order to eliminate privileges embedded in the tax systems. But the LATERAL project has already succeeded in building an energized community, where civil society members learn from and help each other improve research, advocacy, and communication around tax issues in the Latin American region. Lateral Project Partners: ACIJ – Asociación Civil por la Igualdad y la Justicia (Argentina); CAD – Ciudadanos al Día (Peru); Dejusticia (Colombia); ICEFI – Instituto Centroamericano de Estudios Fiscales (Guatemala); INESC – Instituto de Estudos Socioeconômicos (Brazil); ISD – Iniciativa Social para la Democracia (El Salvador); Fundación Solidaridad (Dominican Republic); Fundar – Centro de Análisis e Investigación (Mexico); Grupo Faro (Ecuador). For the June 2018 LATERAL Project workshop in Lima, Peru, IBP will benefit from the contribution of Friedrich Ebert Stiftung – Colombia, a nonprofit involved in projects on tax and equity in the Latin American region considering partnership with LATERAL’s civil society group members.